A milelong temporary bus lane along Rhode Island Avenue in Northeast D.C. this summer could be just a first step toward more extensive, permanent lanes to speed up commutes across the city. WASHINGTON — A milelong temporary bus lane along Rhode Island Avenue in Northeast D.C. this summer could be just a first step toward more extensive, permanent lanes to speed up commutes across the city. “We are looking at this as a way to move people as safely and efficiently as possible, and that will continue to be our priority as an agency,” District Department of Transportation Director Jeff Marootian said in an interview. The temporary bus lanes between 12th and North Capitol streets in Northeast are scheduled to be in place from July 21 through Sept. 3 while Metro has the Red Line shut down between Fort Totten and NoMa-Gallaudet. Brookland and Rhode Island Avenue stations will be closed for the entire 45-day period, including all of August. In addition to shuttle buses, Metro plans to add extra G9 limited-stop bus service down Rhode Island Avenue during the work. 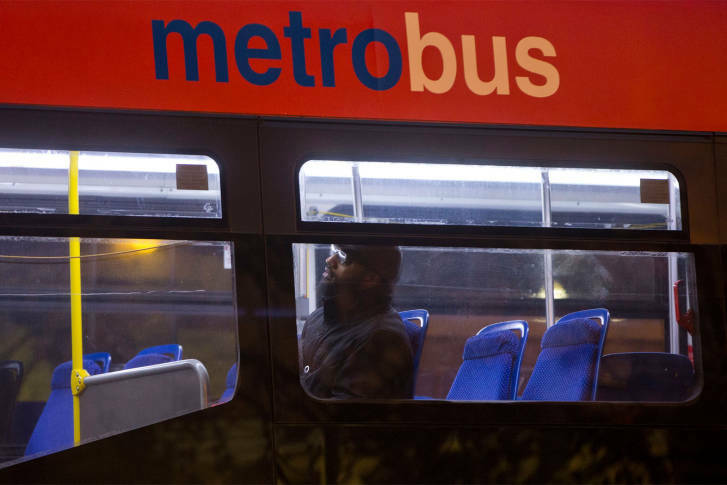 “We are anticipating heavy bus traffic along the Rhode Island Ave. corridor, and, as such, in order to keep traffic flowing and to prioritize the movement of people, DDOT will install temporary bus lanes,” Marootian said. The lanes will be marked with signage and temporary paint. Police and the Department of Public Works will be responsible for enforcing the rules, which will apply from 7 a.m. to 7 p.m. The temporary bus lane will effectively extend rush-hour parking restrictions on Rhode Island Avenue. “We are going to use the opportunity to collect data to better understand how this functions,” Marootian said. Right now, the District only has a short stretch of bus-only lanes, but a number of other bus lanes have long been under consideration or are moving toward implementation. “This will be considerably longer than the Georgia Ave. stretch … similar to how we are evaluating that particular bus lane, we will use this as an opportunity to understand how it operates and to gauge the public’s interaction with the bus lane,” Marootian said. New dedicated bus lanes in the city could also play a key role in the major overhaul Metro is planning for its entire bus system. Similar bus lanes or more significant bus rapid transit projects on varying scales are in the works or open in Maryland and Virginia, too. In other cities, dedicated bus lanes and related improvements have significantly sped up commutes for many bus riders. Commuter disruptions stretch beyond the Red Line shutdown this summer though, with Metro urging riders of the Blue, Orange and Silver lines to avoid the system during a shorter, overlapping stretch in mid-August, with round-the-clock single-tracking and a Blue Line shutdown.